I stumbled upon this RBC white paper on microcaps this morning. The paper hits on a few topics on why microcaps are so unique and why they are such an opportunity. The U.S. microcap equity market is comprised of the smallest publicly traded and investable companies in the United States. These companies, often young businesses with small and motivated management teams, simple business models and concentrated product lines, are inherently biased toward aggressive growth and the advantages of active investment management. 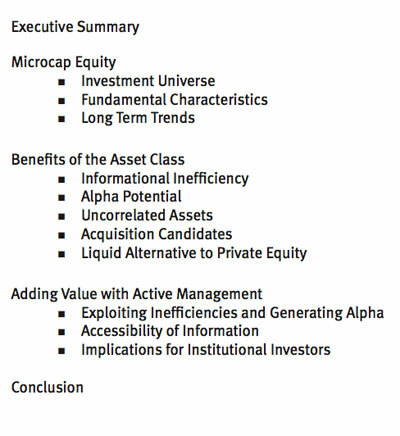 In this paper, we provide an overview of microcap equity, discuss the benefits of the asset class, and explore this compelling opportunity for institutional investors seeking an active investment solution to meet their alpha and diversification objectives. You’re always finding such great articles that support the nanocap investing space. For those that spend the time doing the work, the returns are quite rewarding.